Two years ago Governor Martinez appointed Harrison Schmitt, a self-described “denier” of human-caused global warming, to head the New Mexico Department of Energy, Minerals and Natural Resources. Despite the candidate’s truly heroic history as an Apollo astronaut and his past service as a US Senator, his appointment was doomed. After his views on climate science were revealed, and his association with an anti-science pressure group called the Heartland Institute became known, he withdrew. Unfortunately, the governor has done it again. This time, the candidate is comparatively low-profile, young, and inexperienced. An engineer who served one term as a tea-party-backed New Mexico State Representative before being defeated by a Democrat in November’s election, Conrad James is the governor’s choice for the University of New Mexico Board of Regents. Pro-life: I believe in the sanctity of life from conception until natural death. Children are a gift and should be afforded more protection in the womb. Pro-second amendment: I support the right of individual citizens to bear arms to protect themselves and their families. Pro-traditional marriage: I support the definition of marriage as a sacred union between one man and one woman. UNM students, faculty, and staff might want to ask some hard questions. Will he try to limit access to women’s health services and insurance coverage? Will he want to allow students to keep firearms in their dorms, or tote them into classrooms? Will he oppose efforts to provide benefits to LGBT employees who are in spouse-like relationships? I tried to explain that the predictions are based on the laws of physics and the radiative properties of greenhouse gas pollution. I was a little taken aback. It’s unusual for someone with technical training to have such a strong opinion about a subject without having done any research or reading whatsoever. How can someone who is “massively doubtful” about scientific predictions have no clue about their basis? Trying to be helpful, I offered to send references to the prediction papers, suggesting he read them and publish his rebuttal in a scientific journal. I suggested he take classes in physical climatology and learn the basis for the published predictions and the governing equations. I offered to put him in touch with a UNM climate scientist. Responding to his request for more detail on the predictions, I sent him several historical papers: Arrhenius (1896) (pdf), Broecker (1975) (pdf) and the Charney Report (1979) (pdf). He never accepted the lunch invitation that started the conversation, and I never heard back from him. This was over a year ago. There are scores of researchers at UNM who are engaged in various aspects of climate science. As perhaps the only technically-trained member of the board, the other regents would likely defer to Conrad James on issues related to science. Do we really want that position to be held by someone who is willing to dismiss an entire field of study at UNM, without having done any research whatsoever, with no clue about how predictions are made, and with no “firm grasp” on the basics? Today’s NewsHour story on climate change was a low point for PBS. I would expect Fox News to give equal time to pseudoscientists like Anthony Watts, but this should have been beneath the journalistic integrity of PBS. Did it not occur to the reporter to look into Mr. Watts’ educational background and professional qualifications before giving his opinion equal weight? An AMS seal is a broadcasting credential, and does not suggest any background or training in science. To suggest that Watt’s opinion on climate is valid is like suggesting that a dog catcher is qualified to dispute the professional opinion of 97% of veterinarians. His website specializes in smearing honest scientists and manufacturing doubt. His claims have been debunked over and over (by actual scientists who are held to a standard of professional peer review). Finally, I would suggest that you not accept the framing language of deniers. We scientists are not “believers.” That’s a pejorative term designed to suggest a religious adherence. We are persuaded by facts, evidence, and the incontrovertible laws of physics. Likewise, deniers are not “skeptics.” They believe in “natural cycles” that are not explainable by physics. They believe that urban heat islands can affect the temperature of the planet, despite the fact that cities make up less than 1% of the area of the Earth’s surface, and despite the fact that the places that are warming the fastest (the Arctic and Siberia) lack cities. Deniers are not the skeptics. We are. People who reject pseudoscience are properly called “skeptics.” People who reject facts and evidence are called “believers.” It is dishonest and Orwellian to reverse the meanings of these words. It was one of those picture-perfect late summer afternoons in the Rockies. Forty years ago, on August 10, 1972, I was a teenager on my last real family vacation before starting my senior year in high school. We were camping in Grand Teton National Park. The sun was high and a dark blue sky was blotchy with white clouds. My sister and I had been swimming in a surprisingly warm Jackson Lake, getting sunburned, and lazing around our family’s campsite. After lunch we all decided to pile in the car and drive through the pines to the Indian Arts Museum at Colter Bay. When I was a kid, I loved to read about UFOs, and always wanted to see one. I read popular accounts and watched TV shows about them. Once I found a book at our local library, called “UFO’s–Identified.” The author was Phillip Klass, a skeptic who investigated UFO reports and explained them in terms of natural or man-made causes. Klass’s book changed how I thought about unusual phenomena. It is much more fun and challenging and honest to try to explain such things with science and the laws of physics. To attribute them to some mysterious or supernatural “unknown” is intellectually lazy. It is a shrug at the glory of nature. Paranormal explanations are an uninteresting copout. Klass put me on the path to science and skepticism. 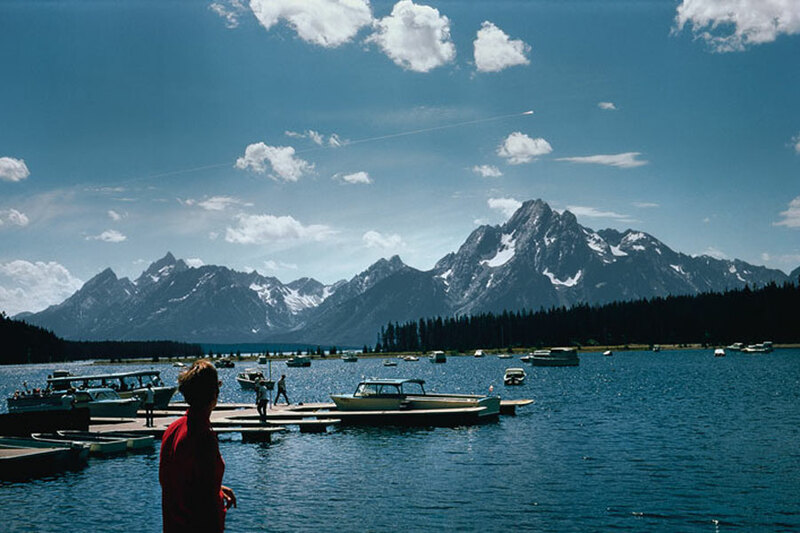 That afternoon at the Tetons I remembered one of his case studies, in which he had meticulously plotted out sight lines and calculated the timeline of one famous historical UFO observation. He showed that it was almost certainly a meteor that had been seen by others, but that the angle of the observation (from directly downrange) made it appear to hang in the sky and move in an unnatural way. I wondered if somebody couldn’t do something like that for this Teton event, and figure out what it actually was. Because of this careful science, we now know that somewhere out in space there is a tiny asteroid with a thin glassy crust it got from the minute it spent rocketing through Earth’s atmosphere as the “Great Daylight Fireball of 1972.” Such is the glory of nature. One of the barriers to finding solutions to global warming is the insistence of political conservatives and libertarians that their right to burn as much fossil fuel as they want cannot be regulated. Since nobody “owns” the atmosphere, we have always treated it as an open sewer for our tailpipe and smokestack emissions. The sky seems infinite. Carbon dioxide is odorless and colorless. Who is it hurting, and what can they do about it? Would conservatives and libertarians have a different opinion if they understood physics and realized that their property rights were being taken without due process or just compensation? There is a strong conservative/liberal split in acceptance of the reality of human-caused global warming among the general population with limited levels of scientific literacy. But within the serious scientific community this political divide doesn’t exist. There is overwhelming agreement among scientists of all ideological stripes that most, if not all, of the rapid heating is attributable to greenhouse gas pollution. Indeed, as many as 98% of the scientists who publish the most climate research have come to the same conclusion: the Earth is getting hotter and humans are the primary cause. The most vocal denial of global warming physics comes from political pressure groups such as the Heartland Institute, which describes itself as a libertarian organization that promotes “free-market solutions.” Their list of “global warming experts” includes a handful of physicists who don’t like the APS “incontrovertible” statement, but tend to publish their objections in newspapers, not scientific journals. Physics Today, our most widely circulated journal, recently published an article on the fundamental physical principles that cause global warming. The author, Prof. Raymond Pierrehumbert, describes how particles of radiant heat energy, called infrared photons, are blocked by carbon dioxide molecules and prevented from escaping to space. They heat up the air instead, and the warmer air sends some of the heat right back to the surface. Our atmosphere has a natural cooling capacity that keeps our planet temperate and habitable. We are gumming it up with our pollution. It’s as if we had an expensive car, and we were dumping wastewater into the radiator, and then ignoring the warning light that was telling us our engine is overheating. Ironically, the legal theories of libertarian economist Murray Rothbard, a co-founder of the Cato Institute and coiner of its name, may hold the key. Rothbard was a proponent of the homestead principle, by which unowned resources — like prairie wilderness, mineral riches, and the cooling capacity of the air above our heads — can be privatized. If you use it for a prescribed period of time, you own it. Rothbard argues, for example, that if a noisy airport is built far from any residential area, it “homesteads” the right to radiate loud sound waves across the surrounding vacant land. If a developer builds housing and the new residents complain about the noise, their right to “quiet enjoyment of the houses” is trumped by the airport’s right to radiate noise. The airport, through homesteading, has earned an easement right to creating X decibels of noise. This homesteaded easement is an example of the ancient legal concept of “prescription,” in which a certain activity earns a prescriptive property right to the person engaging in the action. Presumably, physicists would be the experts called upon to help judges and juries determine rights to resources associated with the ability of the atmosphere to moderate our temperature. Rothbard provides the legal basis for citizen lawsuits against carbon polluters. One of the physical consequences of being alive and being warm is that we emit heat in the form of infrared photons. As a physicist would say, we radiate. Our houses radiate, our pets radiate, our houses, farms, and trees radiate. That’s what helps us and our stuff stay cool. Collectively, that what keeps our planet from overheating. But we don’t have to consider anything collective or planetary. We each have the individual right to radiate, and if you block my photon with one of your carbon dioxide molecules, you owe me just compensation. About twelve years ago I decided I didn’t want four-wheelers driving across my Colorado property on an old mining road. I put some giant boulders in their way. One of their allies filed a lawsuit against me, claiming that the drivers had a prescriptive easement because they had been using the road for more than 20 years (the required period in Colorado). They were invoking the homestead principle, and were outraged in their belief that I was stealing something they owned. They knew they hadn’t bought the road, but they had been using it. However, they couldn’t provide evidence of 20 years of use, so my right to block their jeeps with my rocks was upheld in court. The right to radiate by all citizens has a much easier burden of proof. Our prescriptive easements consist of the gaps in the infrared absorption spectrum of the sky that are now being filled up by pollution. We’ve all been using them for our entire lives. And we can prove it in court if we can convince a judge that we’ve always had warm bodies, and get a physicist to be an expert witness. All we need are some real libertarians to work up some righteous indignation and file a lawsuit. She proceeded to explain her theory that climate change is caused by seasons (I’m not joking). But her comment about the “refreshing cold front” made me curious. We haven’t experienced this in my part of the country, unless by “refreshing” she means “less than 100 degrees”. So I looked up the current weather forecast for tomorrow, to see what parts of the U.S. the “refreshing cold front” was pushing through. All the forecast maps look pretty much the same, but this one happened to be easy to copy so it’s the one I’m using. Now I imagine a columnist who spends her time sitting in an air-conditioned office doesn’t break much of a sweat when she writes. 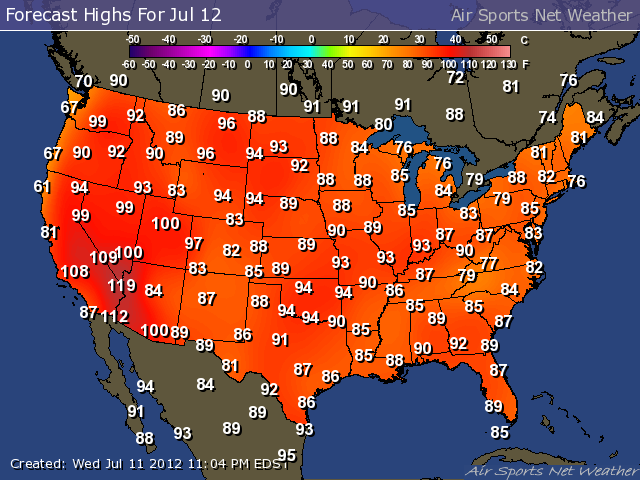 But most Americans actually go outside and can feel the temperature for themselves. Who do you believe? Susan Stamper Brown or your lying nerve endings and sweat glands? And what, exactly, is “conservative” about making stuff up? Last year, I became aware of a conservative political organization called “Energy Makes America Great,” which advocates continued dependence on fossil fuels. According to founder Marita Noon, it is an advocacy group “with a name that is a message.” In other words, it’s not our hardworking citizens, our values, our laws, our democracy, our landscape, our culture, our faiths, our liberty, our Constitution, our innovative scientists, engineers, and inventors, our war heros, our forefathers, or our artists that make our nation great. According to Ms. Noon, we owe our greatness to the coal, oil and gas that we blast, drill, frack, dig up, remove from mountaintops, and burn (unsurprisingly, sustainable energy and renewables are not part of the portfolio promoted by this pressure group). Even though she has no scientific background, Ms. Noon is convinced that scientists are wrong and is a passionate denier of human-caused global warming and outspoken Climategate conspiracy theorist. In order to promote the polluting fossil fuel industry, she has taken a strident anti-science position, comparing scientists to “cornered rats.” She defends the discredited Heartland Institute, which famously made a connection between scientists and mass murderers in its disastrous billboard campaign. But her belief that America’s greatness as attributable to dirty fossil energy, not it’s people, is what I find most irksome. Last month, I spent a week with my daughter in our nation’s capital, where there are no monuments to energy. We admired the tallest structure in Washington, which is named after the father of our country. Ms. Noon might be surprised and disappointed that it is shaped like an obelisk, not a gushing oil rig. We visited the famous memorials to Lincoln and to Thomas Jefferson, a scientist and scholar who wrote the document we are celebrating today. We also visited the newer ones paying tribute Martin Luther King and Franklin Delano Roosevelt. We spent time at the World War II and Vietnam memorials, and the Tomb of the Unknowns, honoring those who lost their lives defending our nation and keeping us free. We paid our respects to the Americans who died in the September 11 attack on the Pentagon. It doesn’t take much reflection on this holiday to understand the reason we honor Americans, not fossil fuels, with our sacred national memorials and monuments. No Ms. Noon, it is not energy that makes America great. Americans make America great. 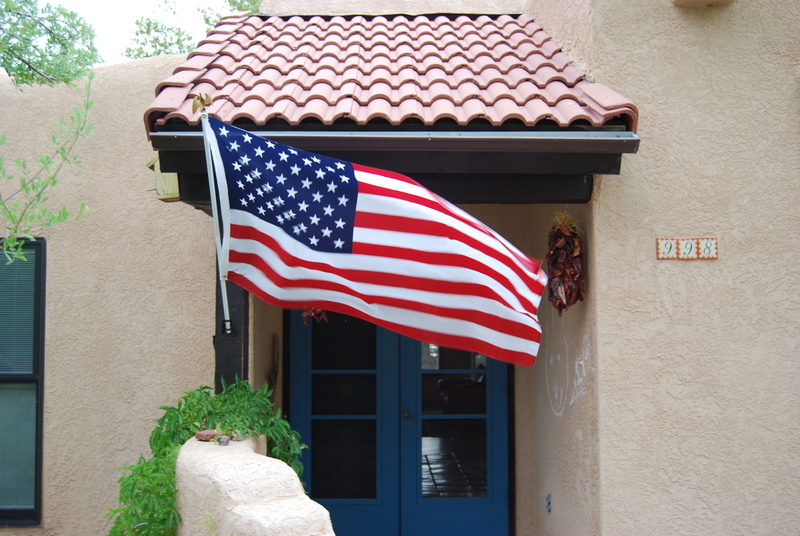 Happy Independence Day from Albuquerque. The Heartland Institute held its 7th International Conference on Climate Change a couple weeks ago in Chicago. It wasn’t very well attended, and many of those who showed up were not actual scientists. Unlike an actual scientific conference, those with dissenting views and who were willing to publicly criticize Heartland’s “research” were not invited. So it was gathering of good old boys who reinforced one another’s beliefs and biases (e.g. the idea that scientists who accept the reality of global warming have a lot in common with the Unibomber). The 3rd Viscount Monckton of Brenchley, was the biggest celebrity in attendance. In a case of life imitating art, he put on a Borat act. To the audible delight of his audience, he showed a fake Hawaiian birth certificate and claimed to be a US citizen. Peter Sinclair captured the hilarity in his own inimitable way. Finally, to see the art that life is now imitating, this send-up of the “Lord” is worth watching.